Libretto, in French, by Eugène Scribe from Salvatore Cammarano�s Italian libretto for Donizetti�s Poliuto based on the play Polyeucte by Pierre Corneille. Live performance recorded in mono 24 June 1978. After his seventh opera Zoraida di Granata (LINK) was premiered in Rome in January 1822, Donizetti�s stock rose rapidly. Domenico Barbaja, impresario of the Royal Theatres of Naples, faced with the loss of Rossini to Paris, contracted the young composer. Fifteen of the twenty operas Donizetti composed in the remainder of the decade were premiered in Naples. But it was in Milan rather than Naples that his big breakthrough came. In May 1830 the Duke of Litta and two rich associates formed a Society to sponsor opera at La Scala. They were concerned to raise the musical standards that had seen Rossini, Meyerbeer and others decamp to Paris. They engaged most of the famous singers of the time including Giuditta Pasta and the tenor Giovanni Battista Rubini. Donizetti and Bellini, recognised as the two best Italian composers of the day were each contracted to write an opera for the season to a libretto set by the renowned Felice Romani. Litta and his associates failed to secure La Scala for their plans, which were realised at the Teatro Carcano. It was in that theatre that Anna Bolena was first heard on December 26th 1830 and spread Donizetti�s name around the world. With his horizons widening and constantly being frustrated by the censors in Naples, who demanded happy endings, Donizetti cancelled his contract in 1832 and left the city. Two years later he returned as musical director of the Royal Theatres and a contract to write one opera seria for the San Carlo each year. The first of these was to have been Maria Stuarda, but the censors interfered, again objecting to the tragic ending. In little more than two weeks Donizetti rearranged the music to a new libretto, Buondelmonte. Needless to say it was only a moderate success. During a trip to Paris at Rossini�s invitation he presented Marino Faliero at the Théâtre Italien. Following on after Bellini�s I Puritani it made few waves. Donizetti however, had seen the higher musical standards and experienced the better remuneration available in Paris and planned to return. Back in Naples he presented Lucia di Lamermoor. It was rapturously received. With the premature death of Bellini in the same year, and Rossini no longer composing opera, Donizetti could claim pre-eminence among Italian opera composers. He fulfilled his contract at the San Carlo with L�assedio di Calais in 1836, Roberto Devereux (LINK) the following year and wrote Poliuto for 1838. This story of Christian martyrdom in Roman times worried the censors. With the work complete Donizetti was told that the King, a deeply religious man, had personally forbidden its staging in Naples and Pia de� Tolomei (LINK CD and DVD) was substituted. The banning of Poliuto was the final straw for Donizetti who left Naples for Paris in October 1838. Once there he agreed to write two operas in French. For the first he turned to Poliuto and engaged Eugène Scribe to produce a French text based on Cammarano�s Italian libretto. Whilst awaiting the ever dilatory Scribe to complete the new libretto, Donizetti presented a French version of Lucia and wrote La Fille du Régiment premiered at the Opéra Comique on 11th February 1840. For the revised Poliuto he rewrote the recitatives, divided act one in two and wrote a new finale. He also added arias, trios and the de rigueur ballet. 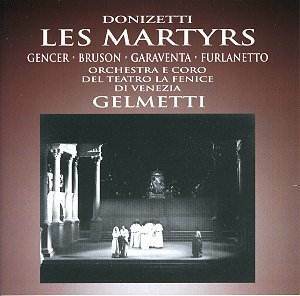 The new four-act version was premiered as Les Martyrs at The Opéra on 10th March 1840. Poliuto in its original form was not performed until 1848. As I wrote in my review of Opera Rara�s Donizetti Pia de� Tolomei, when coming to review a work with which I am not intimately familiar, I like to listen to the recording complete and then follow it through with the libretto. This enables me to get a first impression of the quality of the conducting and engineering as well how the singers and the conductor convey the drama of the work. This issue presented me with major problems. The accompanying leaflet comprises just four sides, of which three are the track listings, in French, and without any indication of which character(s) is singing. As to a simple synopsis, absolutely nothing! My heart sank, at least until I listened to the music and performance. Given that it is a recording of a live stage performance, and in mono, the sound although a little over-resonant is eminently acceptable. The singers are set a little further back on the sound-stage than in a studio recording and there are frequent interruptions for warm, but not excessive applause. There are no audible intrusions of stage noise. Above the qualities of the singers and recording it was the maturity of Donizetti�s musical creation that captivated me. Arias extend into duets and trios with an associated orchestral complexity that marks a significant development in his compositional style. With this observation and stimulus I set out to find a libretto. A search of the web found one in French. The bad news is that there is no translation and it is spread over 44 pages at www.karador.com. With the libretto to hand, and despite my not being wholly fluent in French, I was able to follow the story and comment on the singers. Of the singing cast Renato Bruson as Severe is outstanding. At the time of this recording he was arguably the finest Donizetti baritone before the public. His singing had a wide palette of vocal colour, fine legato and the capacity to characterise a role second to none. In the 1980s and later, with the world shortage of Verdi baritones he took on more dramatic roles with some consequent loosening in his vocal tone. In this live performance his tonal colour and overall characterisation are of the highest order (CD 2 trs 2-6). Severe�s act 3 confrontation with Pauline (CD 2 trs. 7-10) is a dramatic highlight with two singers sparking off each other. In such dramatic scenes Leyla Gencer�s portrayal of Pauline is at its best. Born in 1924 in Istanbul she had an enviable reputation in Rossini, Donizetti and early Verdi. Regrettably her dramatic interpretations put too much pressure on her voice and by the time of this recording she had lost smoothness in legato in exposed lines and a tendency to occluded tone also caused her diction to suffer (CD 1 trs. 4-5). Later on she compensates for this poor start with singing of dramatic intensity that conveys Pauline�s situation and even finishes one scene with some sotto voce phrasing (CD 3 trs. 4-5). As Felix the young Ferruccio Furlanetto is in fine voice with smooth sonorous tone, fine legato and excellent diction (CD 1 trs. 8-10). If his characterisation is not quite up to the standard set by Bruson and Gencer, his vocal quality is a big compensation. As Polyeucte, Ottavio Garaventa is not in the same class as his compatriots. His true tenor voice has a pleasant lyric quality but his contribution is marred by a tendency to push his instrument and strain at the end of phrases. (CD 1 tr. 3). Despite lacking the ideal heft needed, and audibly tiring towards the end of the opera, his contribution does not spoil the overall performance. The Italian chorus are vibrant and committed under Gianluigi Gelmetti�s idiomatic baton. He phrases the ballet music (CD 2 trs. 3-5) with real affection whilst elsewhere supporting his singers at the same time as giving full measure to Donizetti�s music. Both Richard Osborne (The Bel Canto Operas. Methuen 1994) and the current Donizetti Society Listing show this performance as having previously been available on LP. There are a couple of occasions when I detected some pitch variation on exposed strings which made me wonder whether these CDs are derived from LP pressings or a master tape. No matter, unless the likes of Opera Rara show interest, this performance and recording is what Donizetti enthusiasts are likely to be faced with for the foreseeable future. I am glad to be able to be able to write that overall the performance and mono recording enable a good appreciation of the composer�s considerable achievement and one that should be heard by all lovers of his music.